She recently delighted her fans when she shared her #10yearchallenge transformation. And Thylane Blondeau was seen hanging out with her new boyfriend Milane Meritte at the Lumber Yard Mall in Malibu on Wednesday following her viral post, enjoying a fun-filled outing together. 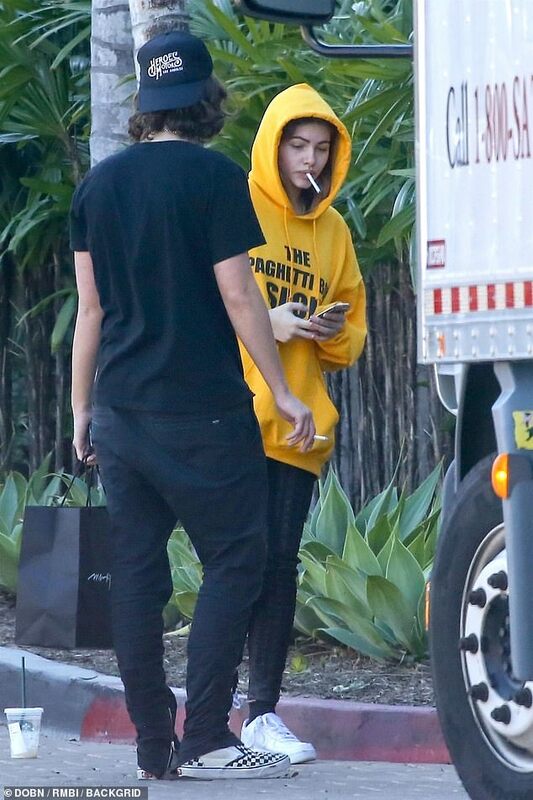 The model, 17, was rocking a casual look in a yellow hoodie and leggings as she grabbed some lunch. Thylane pulled the hood up over her head, going make-up free and flashing a big grin. She opted for comfort above all, setting off the look with a pair of white trainers. Milane was equally low-key in an all-black look complete with baseball and layered chain necklaces. The pair were seen sharing a quick kiss as they took a smoke break together.